When it’s time for a big renovation, Atlanta homeowners are often most excited about getting rid of old, worn out and heavily stained carpeting. The carpeting in a room provides the foundation for the feel of the entire room, and when it’s looking shabby, the whole space suffers. Your old carpeting needs to be ripped out properly — and safely — and you need to make sure you’re disposing of it in a responsible manner. It’s not something you can just set out on the curb and expect your garbage collector to haul away for you! And carpeting is one of the worst offenders when it comes to environmentally unfriendly landfill occupants. Most carpeting is made using processes that involve toxic chemicals, and it’s engineered to last a long, long time. Whenever possible, it should be recycled, donated or disposed of in a way that doesn’t cause harm to the environment. So how are area homeowners supposed to get rid of their carpeting responsibly, safely and without a whole lot of hassle? The key is to let someone else do it! 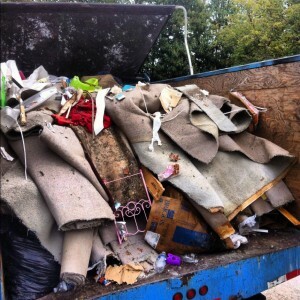 Junk removal in Atlanta GA, whether it’s for old carpeting or other renovation debris, doesn’t have to be a hassle. There are companies in the area that focus solely on removing junk, and for some of them, carpet removal is a particular area of expertise. Instead of trying to do it all yourself, it’s probably best for your safety, security and peace of mind to let a professional come and take your old carpeting away! These services are generally reasonably priced, and they can help you get your renovations on track.